A new study by Argonne and Northwestern scientists reported that solar panels manufactured in China are likely to use more energy to make and have a larger carbon footprint than those made in Europe. Credit: Renee Carlson/Argonne National Laboratory. "While it might be an economically attractive option to move solar panel manufacturing from Europe to China, it is actually less sustainable from the life cycle energy and environmental perspective—especially under the motivation of using solar panels for a more sustainable future," he said. The team performed a type of systematic evaluation called life cycle analysis to come up with these hard data. Life cycle analysis tallies up all the energy used to make a product—energy to mine raw materials, fuel to transport the materials and products, electricity to power the processing factory, and so forth. This provides a more accurate picture of the overall energy consumed and produced and the environmental impact of making and using a solar panel. Assuming that a solar panel is made of silicon—by far the most common solar panel material—and is installed in sunny southern Europe, a solar panel made in China would take about 20 to 30 percent longer to produce enough energy to cancel out the energy used to make it. The carbon footprint is about twice as high. The chart shows the number of years that a solar panel must operate in order to generate enough electricity to "pay back" the energy used to make the panel. Because there are fewer energy regulations in China, panels made there use more energy, according to the study. The colors in the bars represent contributions from the different stages of making a solar panel (e.g., 'Si feedstock' represents the carbon emitted during mining and processing of raw silicon to make the panel). Credit: Fengqi You et. al. The study did not include the energy cost of transporting a solar panel to its final destination. Transportation would magnify the difference even further if it—like 60 percent of all solar installations in 2012—went up in Germany or Italy, Darling said. The team also compared the numbers for different types of silicon solar panels. Single-crystal solar panels are better at harvesting energy than other types, but take the longest to "pay back" the energy used to manufacture them because the process is more energy-intensive. Multicrystalline panels came next, followed by ribbon silicon panels, which are easiest to manufacture but least efficient—however, their payback time was fastest. 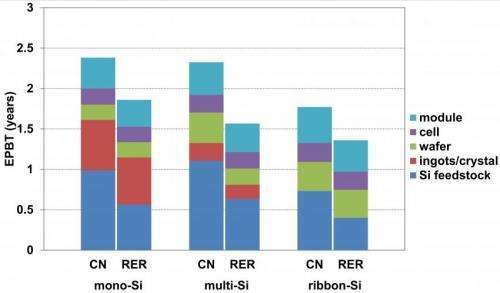 More information: The paper, "Domestic and overseas manufacturing scenarios of silicon-based photovoltaics: Life cycle energy and environmental comparative analysis," is available online and will be printed in the July issue of the journal Solar Energy. Cheap usually implies inefficient, polluting manufacturing. And I think that these researchers have only shone a light on something that we already either knew or suspected. It should be of particularly notable to all my American brethren as an object lesson in economics. 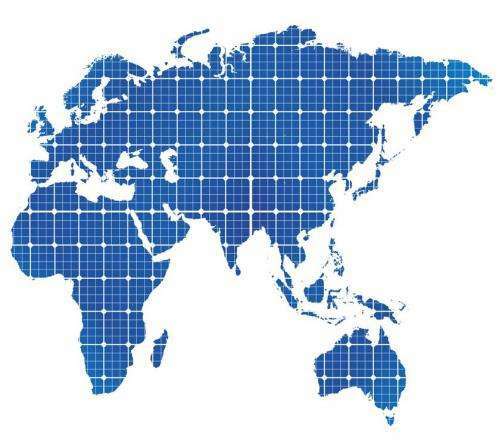 The carbon footprint should be obligatory to appear in big letters in the solar panel and also in all its publicity. Consumers have to be properly informed about this problem, and additional taxes have to be applied to solar panels made with a high carbon footprint. All this is solvable with adequate laws. Agreed. It should apply to a range of other products as well, such as hybrid vehicles. Cheap usually implies inefficient, polluting manufacturing. And I think that these researchers [...]or suspected. "...Communism and socialism (China) are" less well-regulated systems than American and European frei "markets...."
Fixed it for you, mm --now the statement accurately depicts reality. The Chinese government doesn't have more control over its economy than America? Really? Can you show evidence of that? Ah, so --forgive me, modernmystic, sir, for making the error of thinking that you were able to understand the context of my comment. The Chinese are a very highly regulated society and economy. However, it is an unfortunate fact that their regulation of labor exerts downward pressure on wages and benefits, ie, "cheap labor", and regulation of industry is lax in terms of restriction of environmental pollution and overall human health. This makes China a very inexpensive alternative to Western manufacturing. It's as clear as mud Caliban, sorry. Have your cake or eat it. Either a heavily regulated economy is generally better or generally worse. Now I understand there is a point of diminishing returns on a more free or a less free market, but don't shine me on with "heavy regulation is bad there but good here" nonsense. I'm not buying any. We CLEARLY see that heavy regulation of economy isn't a good thing. Just like we can see a market that operates without a sufficient legal framework is not a good thing. It's as clear as mud Caliban, sorry..
As expected, it's all willful disunderstanding on your part, mm. such selectively regulated trading and manufacturing partners, ie, China, India, specifically, and SE Asia/3rd world in general. Forgetting for the moment that has nothing to do with your previous point I'd like you to provide evidence of that assertion. Capitalism inherited poverty, it didn't create it and doesn't need it. Forgetting, for the moment, that you are too stupid to pour piss out of your boot, that is exactly the point which was being addressed, as you expressed a personal desire for clarification. Capitalism may not have invented poverty back in the hoary, prehuman past, but it sure as f**k has come to both define it, create it, and perpetuate it in the here and now, and it is an essential component of the supply/demand/profit Capitalist paradigm. that is exactly the point which was being addressed, as you expressed a personal desire for clarification. Not at all. Your first point appeared to be that the western world's less regulated and controlled markets were superior to China's. When I agreed, you then seemed to be saying that they are less regulated. When I pointed out that is ludicrous you then seemed to be saying that well they are more regulated, but just not well regulated...that's a guess because by now the initial point has been obfuscated by several diversions by you. A common tactic by those who engage in intellectually dishonest debate. but it sure as f**k has come to both define it, create it, and perpetuate it in the here and now, and it is an essential component of the supply/demand/profit Capitalist paradigm. It actually cures poverty, it creates so much wealth even countries that don't practice it benefit from it, and existed when EVERY wage market was low at its inception. Try again. Also, I understand that this is a very emotional topic for you, but if you can't manage to pull yourself up a bit and be more mature, reasoned, respectful, and honest in your replies I see no point in continuing. Uh, no. Just the opposite. Putting words in my mouth won't cure your reading comprehension deficit. When you claimed you didn't understand, I clarified it for you. We were never in agreement. When I pointed out that is ludicrous you then seemed to be saying that well they are more regulated, but just not well regulated...that's a guess because by now the initial point has been obfuscated by several diversions by you. Nah-- that would be you. A common tactic by those who engage in intellectually dishonest debate. Pretty amusing to watch you squirm like this. Not the first time. Prolly won't be the last. Then by all means clarify your initial position. I truly apologize if I was mistaken about what you said. I already did so. Read away. I read away, and what this sounds like to me is that you think that cheap goods gotten from China are inefficient and polluting. Since we don't have cheap goods here in America (we buy those from China, don't we) what lesson is it we're to learn here? It's anything but clear what you mean here. Your willful disunderstanding is the only thing preventing you from acheiving clarity in this regard --as in many others.